ENTRY LIMIT – Limit of one (1) Sweepstakes Entry and one (1) Instant Win game play per person, per email address, per day throughout the Promotion Period. 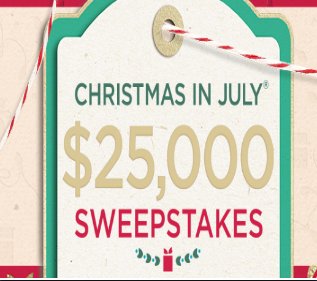 SWEEPSTAKES ENTRY PERIOD – Christmas in July® Sweepstakes begins at 8:00:01 AM Eastern Time (“ET”) on July 1, 2018 and ends at 11:59:59 PM ET on August 1, 2018. The Approximate Retail Value (“ARV”) of the Grand Prize is $25,000. The ARV of all Instant Win prizes is $9,518.88.